Few of us feel delight when we hear the term “tax code”. However, there has been some recent excitement in the area of trust taxation and administration that we all should direct our attention to. Trust income, like an individual’s income, will be taxed in states with income taxes. 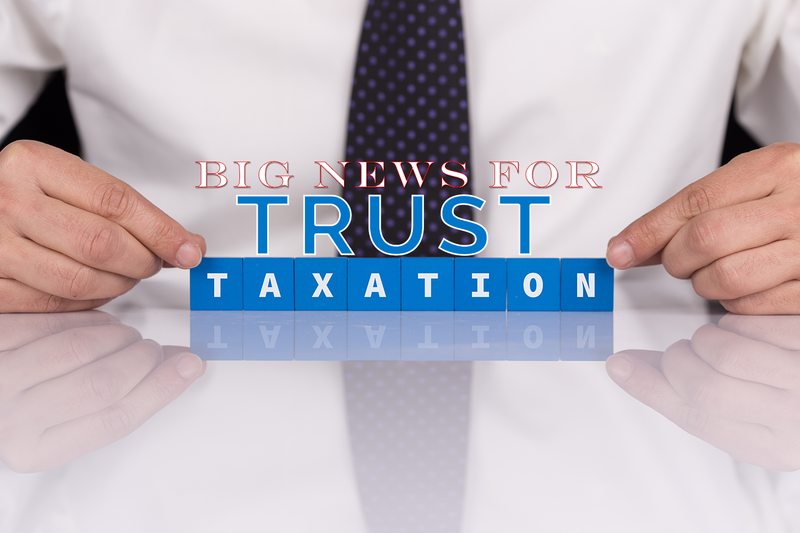 The focus of the recent developments concentrates on the taxation of an out-of-state trust’s undistributed income, not what income is actually received by the trust’s beneficiaries. There is no uniform treatment of trust taxation between the states – the process is state specific. Some states have developed statutory schemes that permit the taxation of an out-of-state trust when a future beneficiary happens to reside within its bounds. However, other states have found that such policies violate due process. This circuit split has led to the Supreme Court of the United States (SCOTUS) to accept a case that will determine the constitutionality of such state taxation structures. This case, N. C. Dept. of Revenue. v. Kaestner Family Trust, No. 18-457 (N.C. filed Oct. 9, 2018), will define a benchmark for the taxation of undistributed income on trusts with out-of-state beneficiaries. This case involves a North Carolina statute used to tax a New York trust, solely on the fact that a future beneficiary resided within the state of North Carolina. Here, the original trust was created in New York, then split into three separate trusts. The trustee resides in Connecticut and the trust is managed by a company in Massachusetts. There were no assets situated, nor disbursements made, within the state of North Carolina; the only connection between the trust and the state was that the beneficiary resided within the state. The question for the SCOTUS is whether such taxation violates the Due Process Clause of the U.S. Constitution. This issue has been tackled in various states so far, with differing results. The Minnesota Supreme Court recently decided a case regarding a trust originally created within the state, by a state resident, for the benefit of four beneficiaries (one living within the state). Here, the trust was subsequently managed by an out-of-state trustee with no trust interests in assets within the state in the tax year at issue – and thus, Minnesota’s connections with the trust were eliminated. The court found that taxation of the trust by the state exceeded the scope of constitutional taxation. (Fielding v. Comm’r of Revenue, 916 N.W.2d 323, 2018 WL 2447690 (2018).) The court opined that the historical contacts with the state were not relevant to the current status of the trust in the questioned tax year. Eleven states have had laws that would tax trust income based upon a beneficiary’s residence within the state: Alabama, California (challenged and found constitutional), Connecticut (challenged and found constitutional), Georgia, Missouri (challenged and found unconstitutional), Montana, North Carolina (now being questioned), North Dakota, Ohio, Rhode Island, and Tennessee. Kaestner creates major questions in both challenged and unchallenged states. It is now time for the SCOTUS to step in and have the final say. Based on the direction of recent cases, it would be reasonable to expect that our highest court will find that a state attempting to tax out-of-state trusts, based on beneficiary residency, is an unconstitutional overreach. Several of these state opinions have said that trusts are separate entities, like individual citizens. Further, such states would eventually get their piece of the pie once the beneficiary actually receives assets from the trusts. The state is attempting to tax an out-of-state trust even though no increase in wealth is derived within the state. North Carolina is ultimately attempting to tax the income of a trust based on an in-state beneficiary simply because no other state is taxing it. North Carolina’s reply brief in the Kaestner case does make an interesting argument towards the fairness of taxing the Kaestner trust under the present circumstances. The trust’s provisions indicate that when Kaestner turned 40, the trust would dissolve and the assets would be distributed. Instead of taking the distribution upon Kaestner’s 40th birthday, she opted to shift the assets into another trust. North Carolina argues that these actions were taken to avoid state taxation of the assets that should have been distributed to her during her residency within the state. Additionally, North Carolina argues that prior precedent declares a trust to not be a distinct legal entity, but merely a fiduciary relationship. It is likely that the SCOTUS will lean towards the unconstitutionality of taxing out-of-state trusts based upon a beneficiary’s residence – but it may be a close call based on North Carolina’s argument pointing out the ultimate unfairness of tax shelters resulting from upholding the Kaestner decision. Allowing taxation based upon a beneficiary’s residency within the state would create a significant complication. What will be the result of taxation upon multiple beneficiaries that reside in separate states? Could this result in another potential Due Process argument that double taxation would result? What would the implications be on “quiet trusts,” in the few states that allow them, where beneficiaries are not even aware of the trust created for their benefit? But, then again, why should states not be able to tax trusts when its beneficiaries benefit from state resources? Arguments will be heard Tuesday, April 16, 2019. This decision will be monumental in the future of trust creation and management. Trusts and Estates attorneys everywhere will be on pins and needles, eagerly awaiting the SCOTUS’s final judgment.